Mercury is in your sign and will likely affect your daily affairs. It isn't easy for you to make decisions in the first place, but don't even try to finalize anything while a retrograding Mercury is in your pocket. Use the energy to research information and gather resources for better decisions later. For All Signs: The current Mercury retrograde is official as of Sept. 24 through Oct. 11. As a general rule we often experience changes of our plans as Mercury alters its course. Decisions made during Mercury retrograde periods will tend to be revised, altered or even rejected after Mercury turns direct. The political polls may shift from the previous direction. We have all experienced many shifts of Mercury, because it does so approximately three times per year. This is the cosmos' way of reminding us to slow down, review and correct errors in thinking. Aries: Mercury is in the territory of significant relationships, contracts and clientele. These areas may be challenging right now because it is difficult to make decisions or finalize activities. Your partner or clientele may be bouncing off the walls. Have patience with yourself and everyone else. Taurus: This retrograde experience occurs in the territory of health, co-workers, tenants, employees and pets. You may find it very hard to move forward with your diet and exercise program. It is a particularly good time to organize and sort closets, records and files. Gemini: Mercury is turning in the territory that rules children, creative efforts and love life. Anything on your radar screen that is related to these territories is subject to turnaround for a few weeks. Maybe you'll want to check out a previous love interest. Cancer: This time for the Moon Children: focus is related to property, family and issues of security. You are likely reworking things in one of these territories. Family members may be erratic or hard to pin down, making it difficult to conclude open agendas. Leo: The retrograde focus is specifically on communications, neighbors, siblings, and others who are in your daily environment. Concentrate as much as possible on clear communications. Double check what you think you heard. You may need to consider the needs of your vehicle now. Virgo: The probability is high that you will discover some mathematical error made in the past that must be rectified fairly soon. It may be as simple as finding a bill that was forgotten and left unpaid. Or it could be a little more emotionally complicated and involve a previous misunderstanding with a loved one. 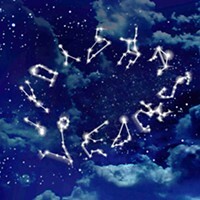 Scorpio: Memories from your life history may surface for examination at this time. Old friends or acquaintances who return for a short time could be the trigger for this life review. It is possible you may have a greater-than-normal need to reflect, to write and otherwise give attention to your inner self. Sagittarius: Mercury has been in the territory that concerns friends, organizations and community contacts. You may be having difficulty bringing things to fruition or conclusion in any of these areas. Perhaps you are compelled to put previous plans on hold. Capricorn: Mercury is altering directions in the house of career and life direction. This is really more of a tweaked change than a life change. However, if you happen to have applied for a job recently, you may find that you are changing your mind about that particular route. Now is the time to research the best possible choices. Aquarius: Mercury is in the territory which deals with education, publishing, travel, public speaking, the law and philosophy. Therefore any of these activities are subject to shifts, changes or sudden deceleration due to lack of decision. Maybe the right solution just is not available yet. Pisces: Mercury is in the territory of taxes, debt, investments and joint resources. You will likely experience a need to go back and review decisions in these areas. Be alert to the higher probability of making errors now.